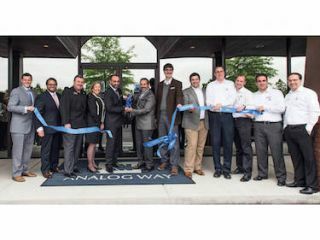 Analog Way recently opened its new headquarters for the Americas in Gwinnett County, Metro Atlanta, GA. The company hopes to strengthen its presence in the U.S. market and develop more services for local customers. The Analog Way team along with local representatives of the Gwinnett Chamber gathered together on April 12 to inaugurate the new company’s headquarters for the Americas. After the traditional ribbon-cutting ceremony concluded, the facility remained opened all day for the Analog Way experts to run various activities to the guests such as product demonstrations and trainings. After more than 15 years in Manhattan, Analog Way chose Atlanta, GA, as the site for its new facility. The company cited increased sales in the last few years in the U.S. as motivation for the move to a larger facility best adapted to its continued growth. The new 15,000-square-foot facility includes a warehouse that will help increase storage capability in order to optimize delivery time and improve after-sale service. Several rooms at the new facility have been especially designed to welcome trainees. Analog Way is committed to supporting its customers through training that enables integrators, consultants, and freelance technicians to gain new skills, and thus be able to deploy more creativity when using the products. The first training sessions at the new facility will take place in May, 2016.